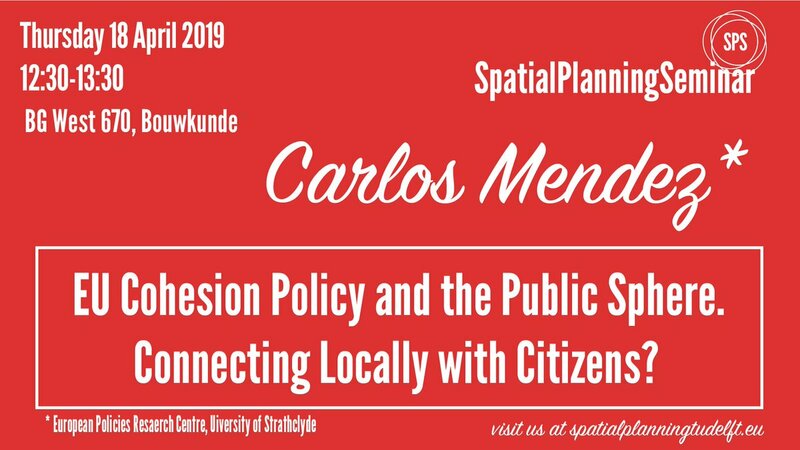 Carlos Mendez is a Senior Research Fellow at the EPRC, University of Strathclyde, which also has a base at the Faculty of Architecture and the Built Environment of TU Delft (EPRC Delft). He has degrees from the University College London (BA), London School of Economics (MSc) and Strathclyde (PhD). As a specialist on the European Union and regional development policy, Carlos’ main research interests include EU Cohesion policy, the EU Budget, and regional policy in Portugal and Spain. He has co-authored a monograph on EU Cohesion policy, published various academic articles and policy reports, and worked on a wide range of projects and evaluation studies for EU, national and regional institutions. He was the project manager for COHESIFY, a Horizon 2020 project assessing the impact of EU Cohesion policy on citizens’ attitudes to the EU, in which Urbanism team cooperated with the EPRC. At the seminar, Carlos will present some of the key conclusions from COHESIFY of relevance for European cities and regions.